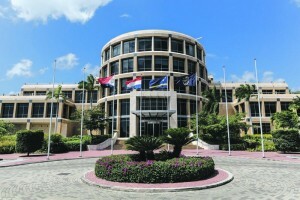 PHILLIPSBURG, WILLEMSTAD - The members of the Supervisory Board of the Central Bank of Curaçao and St. Maarten (CBCS) are at an impasse about extending the term of one of its soon-to-be retiring managing directors. The extension is seen as necessary while a new president and managing directors are sought after for the Bank. CBCS President Emsley Tromp is currently facing legal troubles and is not at the helm of the country’s financial supervisor. The two remaining managing directors – Jerry Hasselmeyer and Alberto Romero – are nearing the end of their tenures due to age requirements. The Supervisory Board recently met about the extension of the managing director’s tenure. That resulted in a three to two vote in favour of the extension. However, the CBCS charter requires a five-sixth vote to carry such a decision. Gibson Sr. did not divulge who of the two managing directors was the subject of the vote by the Supervisory Board. The recent vote, therefore, has been met with “a storm of objections,” said Finance Minister Richard Gibson Sr. in the Council of Ministers Press briefing on Wednesday. The “vendetta continues” among the supervisory board members. This shows they are not acting in the best interest of the Central Bank, said Gibson Sr. The Minister has written to the supervisory board members Robert Pietersz (chairman), Tom Kok, Miriela Carolina, Vance Williams and Hubert Lopez to work on a solution to the impasse. If one cannot be found, there will be “no other choice, but dismissal” of the board, he said.